High quality doors and PVC-U window frames – with effective double or triple glazing – can significantly improve the energy efficiency of your home. Technically advanced VEKA window & door systems have been designed to save you money on your heating bills and minimise carbon emissions. Top quality components, efficient production and the latest in glass and PVC-U technology enable VEKA fabricators to produce home improvements which perform to the highest standards and are recommended by the Energy Saving Trust. Energy Rated Window (WER) labels are the UK’s way of illustrating the energy efficiency of windows. Window Energy Ratings use an easy-to-understand, traffic-light style A-E ratings guide similar to that used on ‘white’ goods such as fridges and freezers etc. This ratings label can be used by you to make more informed choices about the energy efficiency of the windows you invest in. With environmental concerns about carbon emissions continuing to grow, we are all looking for ways to make our homes more energy efficient. 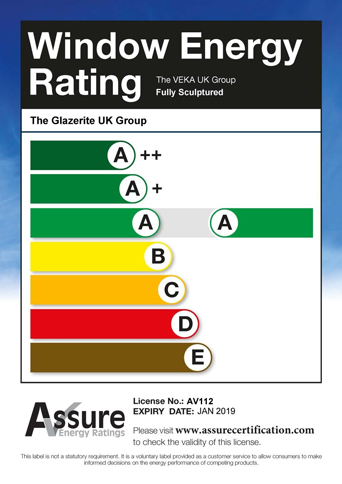 As a world leader in innovative ‘green’ solutions, VEKA, in conjunction with one of Independent Network’s founder members, created the UK’s first ‘A’ rated window, and the first fully reinforced, double-glazed window to gain the prestigious ‘A’ rating. Basically – energy-efficient windows help to contain and conserve heat in the home. They withstand the elements, keep out cold and draughts, minimise sound pollution, resist condensation and allow the natural warmth of the sun to help heat your home. To see how much money you could save on your energy bills and to find out how significantly you could reduce your carbon footprint, consult the table below or use the ‘Carbon Calculator’ on www.ggf.org.uk. Above table shows comparison using ‘A’ rated windows.